This Mexican-style shredded chicken is my go to for tacos or burrito bowls. It's super easy to throw together and uses simple ingredients that you probably already have on hand! You can easily sub ground chicken, turkey or grass-fed beef (see Tips and Tricks at the end of the post). How do I make shredded chicken? 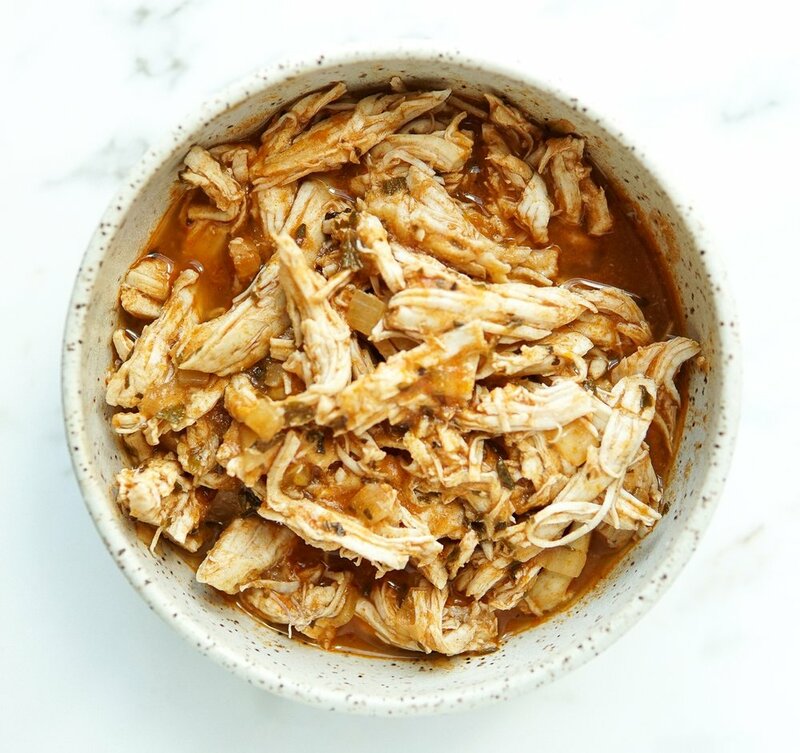 Making shredded chicken at home is a great way to cook chicken for meal prep and it's super simple! Place it in a pot filled with enough water or broth to cover the chicken. Bring it to a simmer and cook, covered for 10-20 minutes, depending on the size of the chicken. Remove from the pot and use two forks to shred it up! How do I make my own taco seasoning? Making your own taco seasoning at home is super simple! You might be surprised to know that those little taco seasoning packets you buy have fillers, sugar and other nasty ingredients you don't need in your life. I keep it simple and use equal parts cumin and oregano, but you could add in chili powder, onion powder and garlic powder. In a medium pot, warm the oil over medium-high heat. Add the onion and salt and sauté until softened, about 5 minutes. Add the garlic, cumin, oregano and tomato paste and cook for 1 minute, using a wooden spoon to stir and mash the tomato paste around so it's coating all of the onions. Add a splash of oil if it looks to dry in the pot (this will help bloom the spices and caramelize the tomato paste). Add the water or broth and chicken and nestle it in the liquid. Sprinkle the chicken with an additional generous pinch of salt. Bring the liquid to a simmer, cover, and cook for 15-20 minutes, flipping the chicken halfway through. This may take longer depending on the thickness of your breast. Once cooked through, transfer chicken breasts to a cutting board and use two forks to shred them. Return to the pot and simmer for another minute, to reduce the liquid into a thicker sauce. Add more salt and/or spices, to taste! Serve it up on tacos or as a burrito bowl! If using ground meat, use half the amount of water, adding more if you think it needs more moisture. There is no need to cover the pot, just add the meat to the pan and let it brown, then break it up into chunks and continue to cook until its cooked through and the sauce has thickened.